The equipment has a very user-friendly and practical handling. The uniqueness of K & M airporttechnik is the fast and trouble-free recovery time of the aircraft. All wheels of the dolly are 360 ​​degrees radially rotatable which results in a small wheel load per cm. This also leads to a short way to roll of at a zero meters turning circle. Several Dollies can be used at once on an airplane. 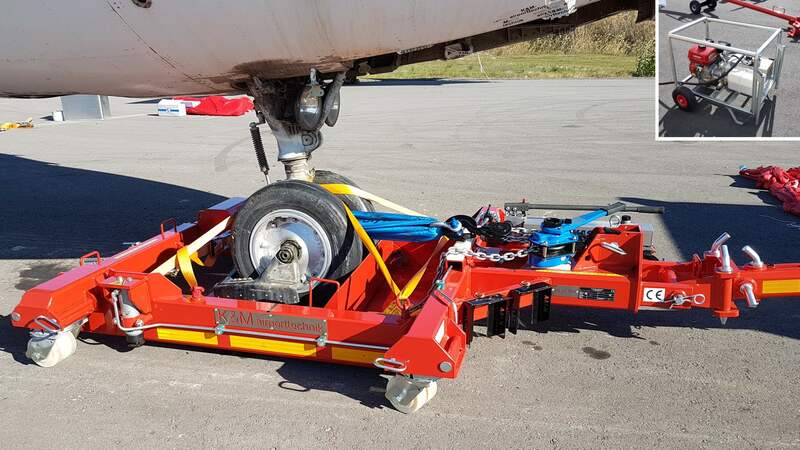 Due to the incomparable pushback function of the recovery vehicle, the aircraft can be pulled or pushed forward and backwards with the recovery vehicle. When the aircraft is completely loaded on the recovery vehicle, lateral displacement is possible at any time. Rescue dollys for aircrafts are available for payloads up to a hundred tons. There is no sinking in while using up to 16 twin wheels – means 32 wheels – and less than 323.8kg / cm load. The platform can completely be lowered to the ground – this ensures a quick rescue within 20 minutes of the aircraft in case of tire damage. In addition, there is a minimal force on the dolly and only a minimal difference in level of max. 50 mm when recovering the aircraft on the recovery vehicle. Upon individual request support platforms are made in special sizes. Necessity is the mother of invention – that describes in the best way how the company K & M airporttechnik was established by their two foundersWalter Mühlfellner and Franz Körbler in 2007. It all started with an accident at Graz Airport, where an aircraft should have been rescued in the fastest way possible. However the endeavour seemed to be more difficult than expected, because the necessary recovery equipment was basically non existent. Reason enough for the two bright minds to get together and start inventing a suitable solution that would permanently change the future and security at airports across Europe. After all, those two together combine over 80 years of experience at the airport and at the fire brigade. The prototype of a dolly was created and came into use shortly afterwards at Graz Airport. With vast success, as it seemed. As a result, Vienna Airport also became aware of this innovative implementation of a rescue dolly, that had never been seen before. After a few adaptations the next dolly went directly to the capital of Austria. Hence the foundation for K & M airporttechnik was layed. Shortly afterwards, the entire Austrian market was supplied with the recovery vehicles of the two-man company which is based in a small village named Werndorf. And Austria should only be just the beginning. Far beyond home borders, the numerous products, developed by the two founders, are nowadays used at airports throughout Europe. The dollys and various products of K & M airporttechnik are currently being used successfully at the airports in France – Cannes, Münster, Osnabrück, Ljubljana, Ibiza, St. Gallen, Montpellier, Us Airforce Airbase Turkey, Madrid, Barcelona, ​​Palma and Hanover.